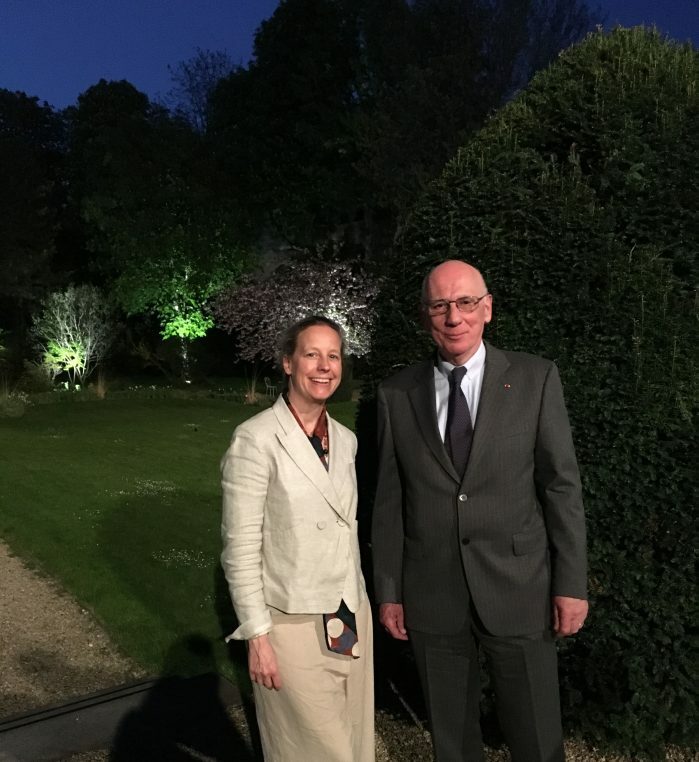 It was a lovely literary evening at the Swiss embassy in Paris where Ambassador Bernardino Regazzoni and his delightful wife were hosting Swiss writer Joël Dicker to celebrate his fourth best seller “La disparition de Stéphanie Mailer” which sold 48 000 copies in its first six days. The dashing writer who was discovered by publisher Bernard de Fallois, gave a wonderful presentation and described extensively his writing technique under the attentive ear of Michel Zink, the newly elected academician and Medievist. 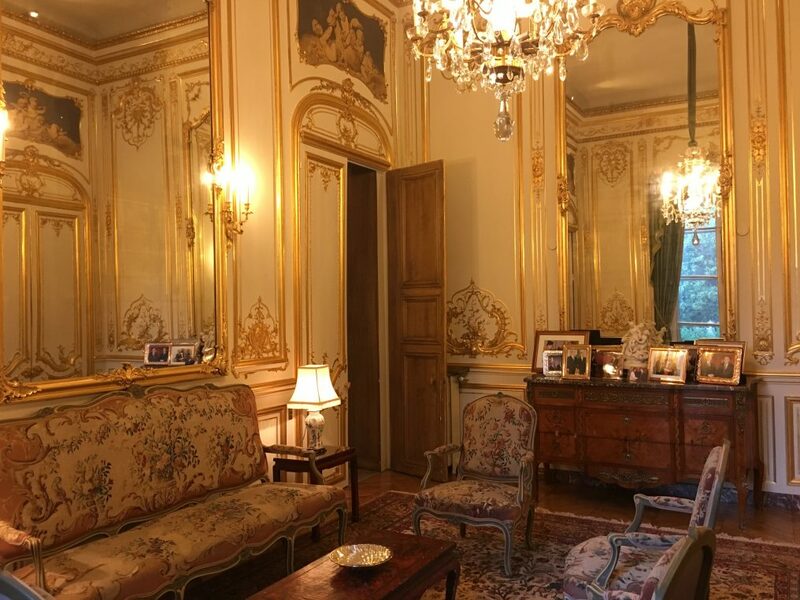 The Swiss Embassy in Hotel de Besenval on rue de Grenelle, is one of the most beautiful houses in Faubourg Saint Germain built by architect Pierre Alexis Delamair and that evening the 25 ° centigrades allowed for a perfect dinner in the gardens. 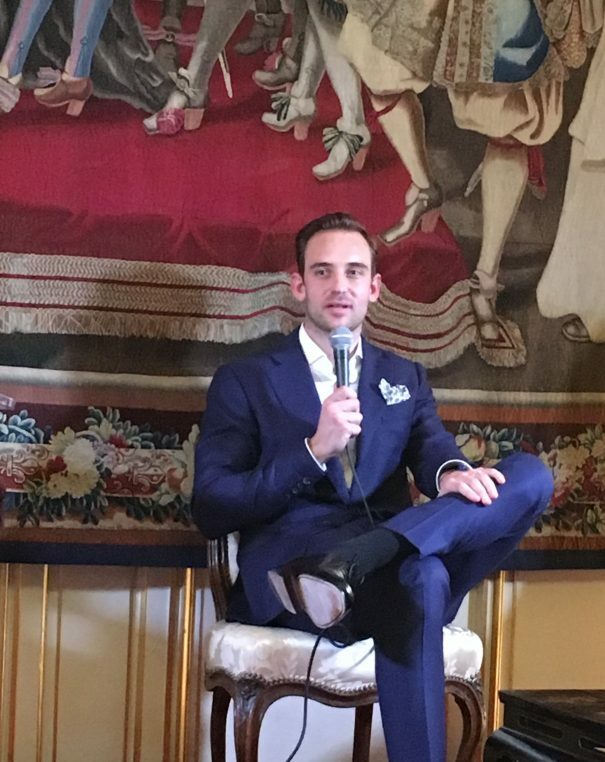 Joël Dicker was hosted by the couple who had already celebrated his novel’s Italian publication “The truth about the Harry Quebert affair” when they were posted in Rome six years ago. So its was a very relaxed atmosphere among old friends and the author described with great freedom his writing techniques. After three novels taking place on the East coast of America, he is considering writing about another country and possibly Switzerland. 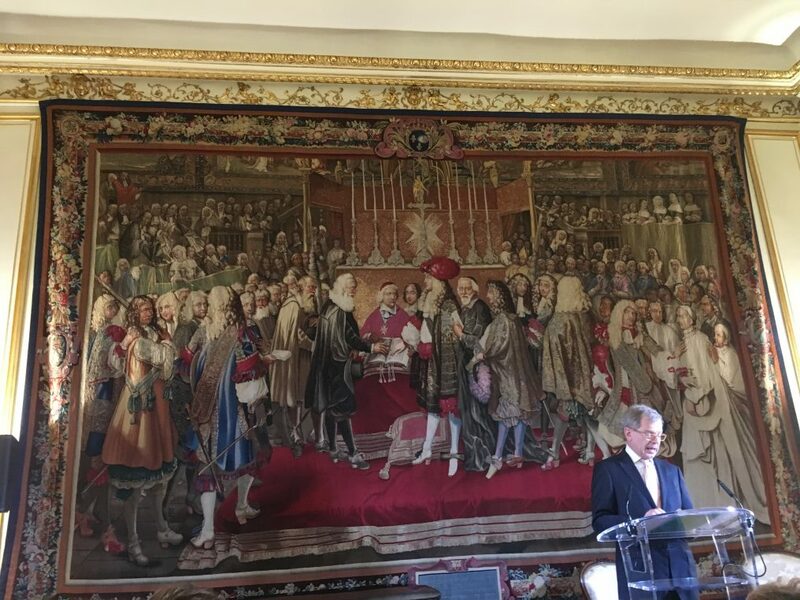 It was fantastic to be able to walk around the newly gilt 18 th century salon des Ministres and to see the large tapestry celebrating the delegates of Swiss cantons being received by Louis XIV th at the Cathédrale de Paris. (By the way Philip Mansell’s biography of Louis XIVth is soon to be published). 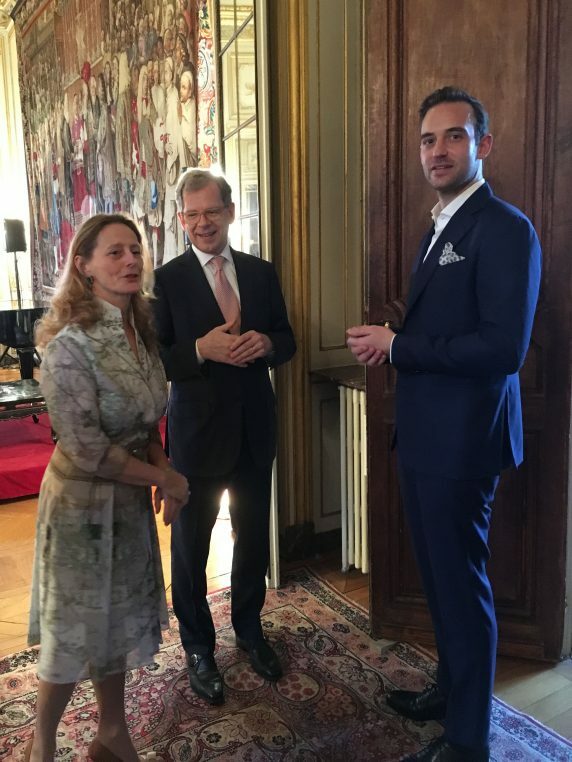 There is a special kindness among Swiss diplomats hat could be felt among the Embassy staff and it was a particularly soothing and luxurious evening. The ambassador was born in Lugano and there were delicious gnocchis for dinner. 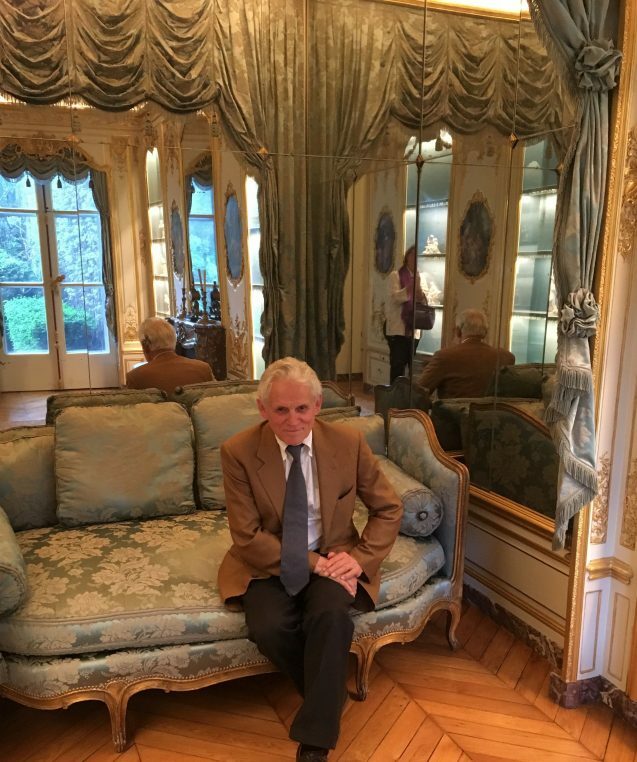 Jean Jacques Annaud has bought rights do develop a series on “The Truth about the Harry Quebert Affair” which will be aired on TF1 in France in the fall and all around the world. Joël Dicker visited him in Verbier where he locked himself up to write the script and was fascinated by the shooting in the US. After visiting more than two hundred houses on the East Coast, the director decided to build one on the St Laurence river which was the perfect location for the thriller originally set in Maine. So the future looks very bright for Joël Dicker who has already sold close to 400 000 copies in a month. The pressure of course becomes stronger with every success but when he was asked if he wanted to switch to writing scripts, he firmly said that his medium was writing novels and that he needed to be fully in charge of the story. Dicker at 32 is a wonder boy and saves no energy to charm his public. He ended his chat saying he wished very much his book would be published in China next year when the Regazzonis will be posted in Beijing! There is nothing like long time friendships.